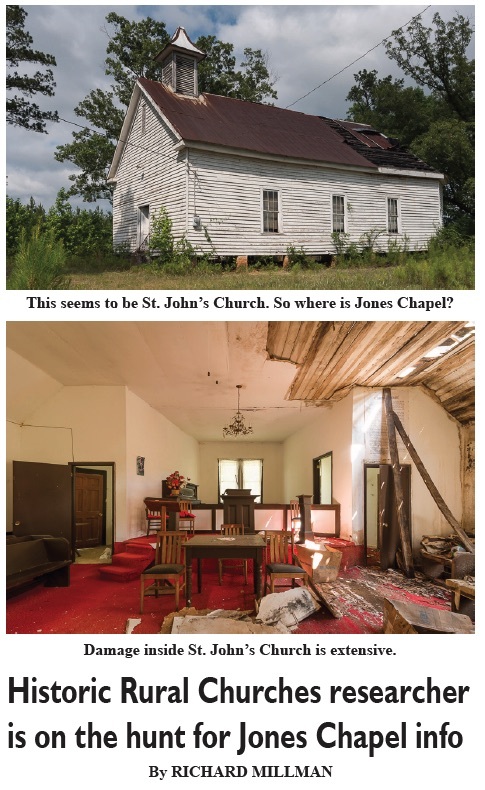 Won’t you please join me in a search for the mystery of the history of Jones Chapel Road in Wilkes County. The road begins as paved, but turns to a dirt passageway among planted pines and woods in the area of the Danburg community. A typical quiet, southern country dirt road until you come to a sharp 90 degree curve by the Fishing Creek Wildlife Management Area. Just off the road is an old building that has fallen into neglect and disrepair. Since this is Jones Chapel Road and this appears to be a church, typical logic would say this is indeed Jones Chapel. Much of the rear of the roof is missing and every rain causes more damage to the piano and pews inside. Mother Nature is slowly and systematically taking away this relic of our past. Here the mystery begins. It is not Jones Chapel, but St. John’s church. So, where is Jones Chapel? That is why I am writing this article, to solve that mystery. I need the help of local citizens who know the history of this road.